We’re committed to putting our research into action by creating real resources to help people read and understand the Bible. 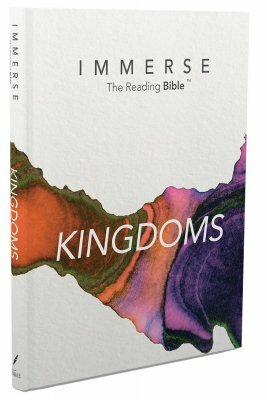 So we partnered with Tyndale House Publishers to create Immerse: The Bible Reading Experience, our signature program and our best work yet. 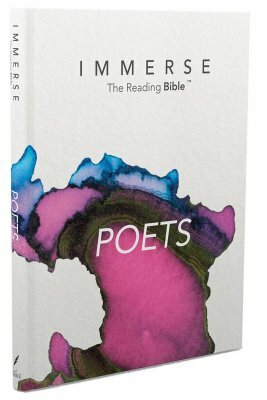 Using a Bible designed for reading at length, readers are invited to get lost in the stories, poetry, letters, and other literature that make up that grand narrative of the Scriptures. 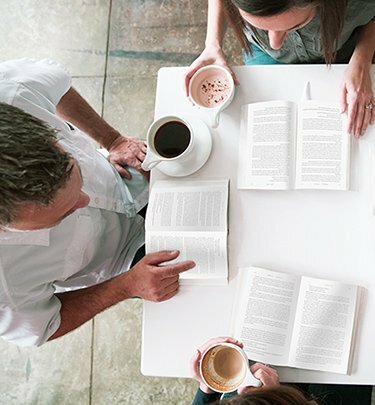 A simplified “book club” discussion model encourages groups to read large portions of the Bible and simply talk about what they read. 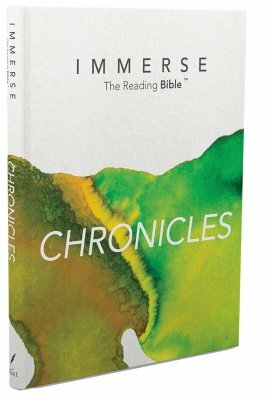 Immerse invites churches to make regular, intentional Bible reading a core piece of their community’s identity. By participating in two 8-week experiences per year, churches can read through the entire Bible together in three years. It’s not a Bible study. It’s ultimately an invitation to a vibrant, transformative relationship with God and with each other through his Word. It starts with a new kind of Bible. 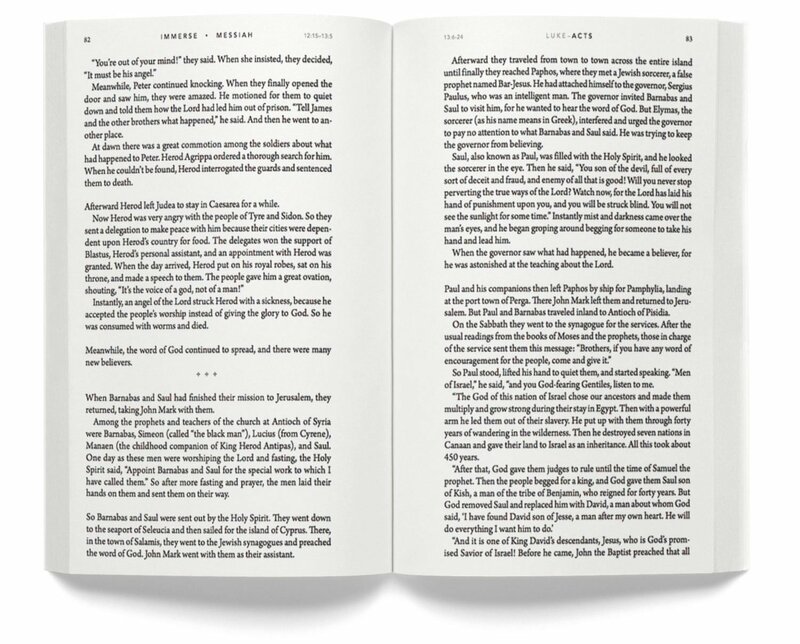 Using all of the latest research on typography and page design, we created a Bible with one goal in mind: to provide the best reading experience possible. 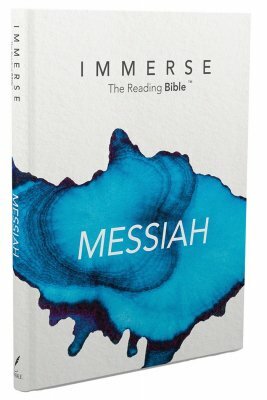 Immerse: The Reading Bible restores the Bible’s text to its natural literary form: stories look like stories, songs look like songs, and poetry looks like poetry. 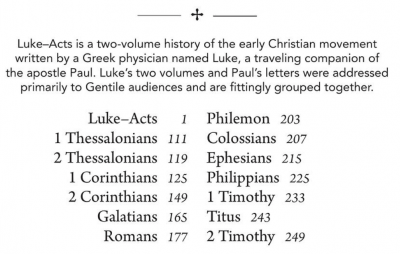 Rather than traditional chapters and verses, each book is formatted based on the natural literary structures the authors incorporated when the books were first composed. In some cases we reordered the books in a way that makes more sense for cover-to-cover reading. 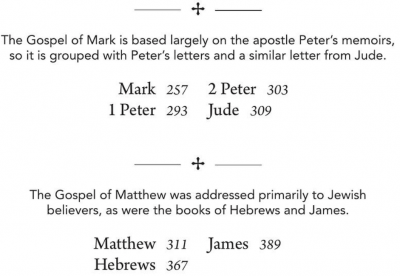 For example, we rearranged the New Testament so that all four Gospels aren’t bunched at the front, and Paul’s letters are in approximate chronological order rather than the traditional order of longest to shortest. 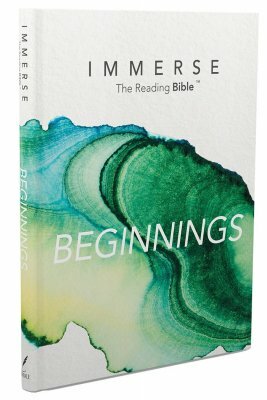 Rather than the traditional Bible study format, Immerse encourages groups to simply have unmediated conversations about what they’ve read, more like a book club. There are no study guides, workbooks, or DVD lessons. Was there anything confusing or troubling? 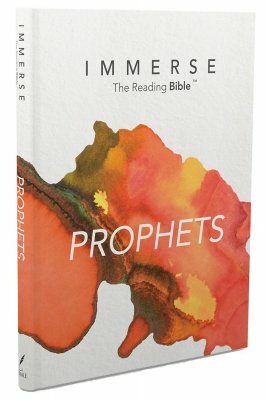 Instead of one big book, Immerse is divided into six readable volumes. 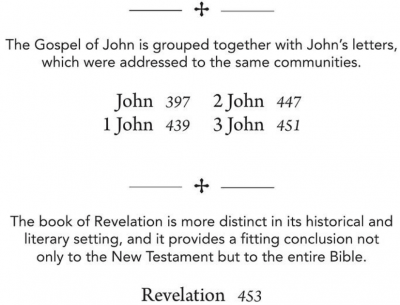 If a church reads two volumes per year, they can read the entire Bible together in three years. Once they finish, they can start over again. Regularly spending time in God’s word together can become a core part of their life together as the body of Christ. Experiencing life together, deeply engaged with God’s word on an ongoing basis. That’s the vision for Immerse.